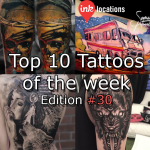 Welcome to the thirty-first edition of InkLocation’s Top 10 Tattoos of the week! In Hebrew and Arabic languages Hamsa means ‘five’. This symbolizes the five fingers on a hand and the five senses that humans have. The Hamsa symbol is a beautiful artistic rendering of a hand which often encompasses an eye in it’s palm or other symbols which represent protection. These days a lot of people have permanent Hamsa Tattoos decorated for individual wards of protection and also as a symbol of good luck. It can also known as the hand of Fatima, the hand of Mary or the hand of Miriam depending on the religion. 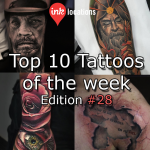 Welcome to the twenty–sixth edition of InkLocation’s Top 10 Tattoos of the week! Sorry for featuring a few artists a couple of weeks in a row, but some pieces are just too awesome to not post up. 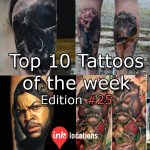 This week features Ben Klishevskiy (@ben_klishevskiy), Jun Cha (@juncha), Karol Rybakowski (@karolrybakowski), Mystik (@mystiktattoos), Nicklas Westin (@nicklaswestin), Q (@q_tattoos), Rich Pineda (@richiebon), Steve Butcher (@stevebutchertattoos), Timofey Nikulshin (@nikulshin) and Tony Nguyen (@inkfiend_tony) . 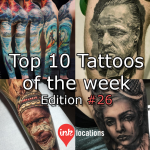 Welcome to the twenty–fifth edition of InkLocation’s Top 10 Tattoos of the week! 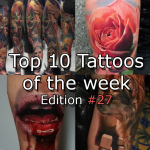 This week features Charles Huurman (@charlyhuurman), Eliot Kohek (@eliot.kohek), Felipe Rodrigues Fe Rod (@rodferod), Karol Rybakowski (@karolrybakowski), Matthew James (@matthewjamestattoo), Mystik (@mystiktattoos & @yung_chavo), Nikko Hurtado (@nikkohurtado), Robert Borbas (@grindesign), Sergio Sanchez (@sergiosanchezart) and Victor Chil (@victor_chil). 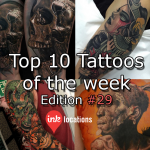 Welcome to the twenty–fourth edition of InkLocation’s Top 10 Tattoos of the week! This week features Boris (@boristattoo), Damon Holleis (@damon_tattoos), Daniel Rocha (@danielrochatat2), Dointats_bj (@dointats_bj), Dylan Weber (@dylanwebertattoos), Eugene Knysh (@levgen_eugeneknysh), Khan (@khantattoo), Mark Wosgerau (@markwosgerau), Phil Garcia (@philgarcia805) and Yomico Moreno (@yomicoart).